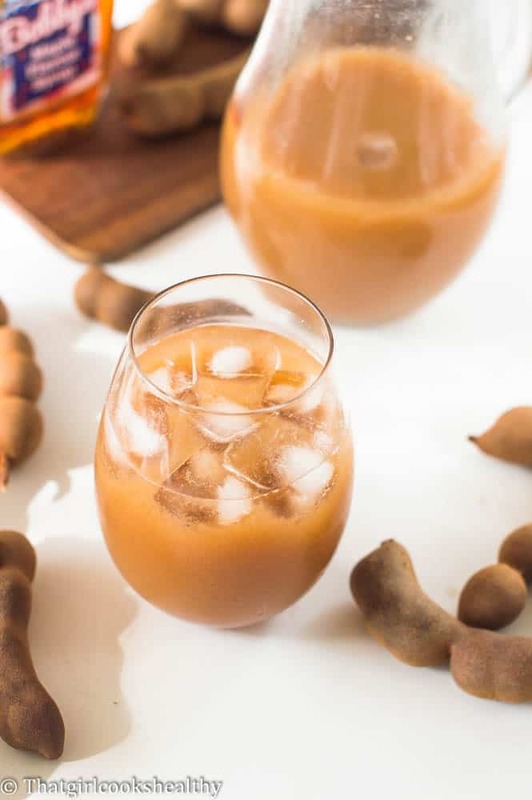 Tamarind juice recipe – Enjoy the healthy benefits of refreshing tamarind juice made the scratch and sweetened with coconut nectar with a hint of ginger to tantalise your taste buds. If you are looking for a drink that is refreshing with a tropical twist then tamarind certainly fits the bill. This drink will definitely quench your thirst on a hot summer’s day. 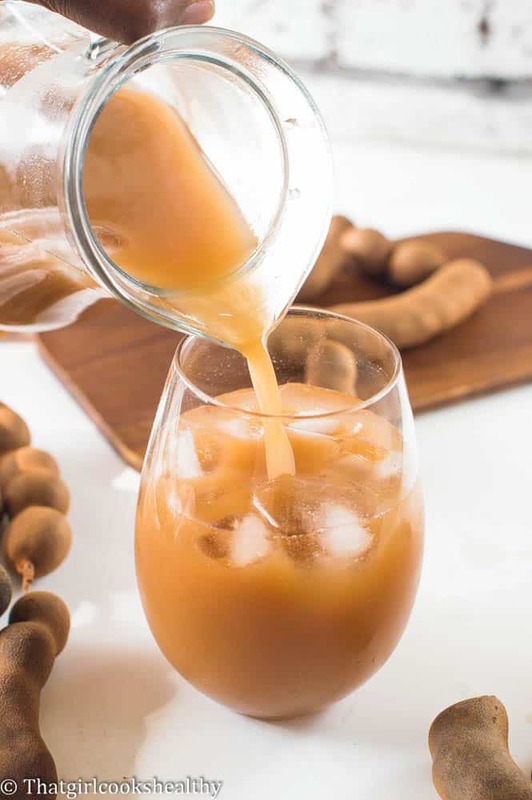 Tamarind juice is perfect to accompany and dinner party or even prepare for that annual family BBQ. In case you are not familiar with what tamarind is then let me explain. Tamarind is a long pod with a hard brown shell. The fruit is indigenous to Africa but cultivated in many tropical regions including Asia, Oceania, the Caribbean and Arabia. What is tamarind used for? The pulp is used for culinary and medicinal purposes and plays a crucial role in Indian cuisines. Ironically India is one of the biggest manufacturers of tamarind and with how prevalent the use of the fruit is, it’s hard not to believe why. In the Caribbean Tamarind is referred to as Tamarindo by the Spanish speaking islands – Cuba, Dominican Republic and Puerto Rico. The English speaking Islands like Trinidad and Tobago, Jamaica, Barbados etc.. like to make a delicacy called tamarind balls. The pulp is rolled into a small ball and coated with a dusting of sugar for sweetness. It is also used to make paste, chutney and or a sweet beverage. What is the taste of tamarind? Tamarind has a instinctive taste, it’s almost like a juicy acidic sourness with a slight tangy sweetness. Most people tend to sweeten tamarind which makes it more tolerant to use. Do not be deterred by the description of the taste because tamarind juice is extremely tasty. If you like lemon or lime juice then tamarind juice will win you over. 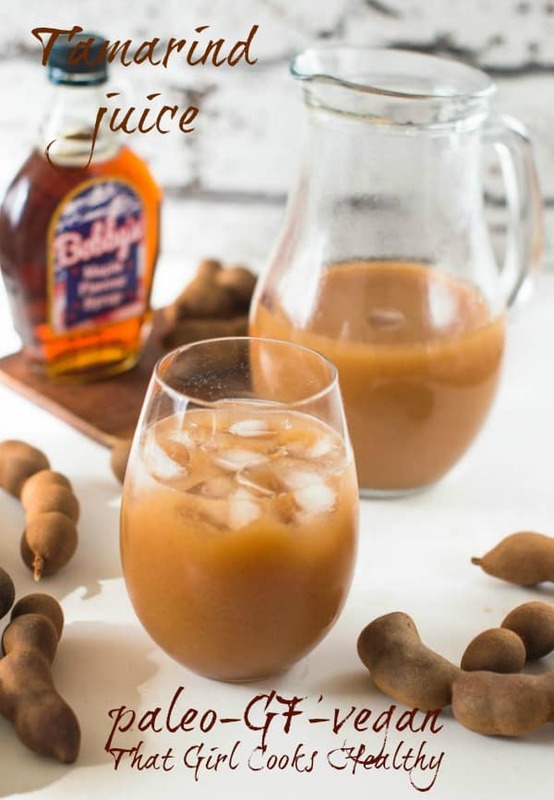 How to make tamarind juice from scratch? 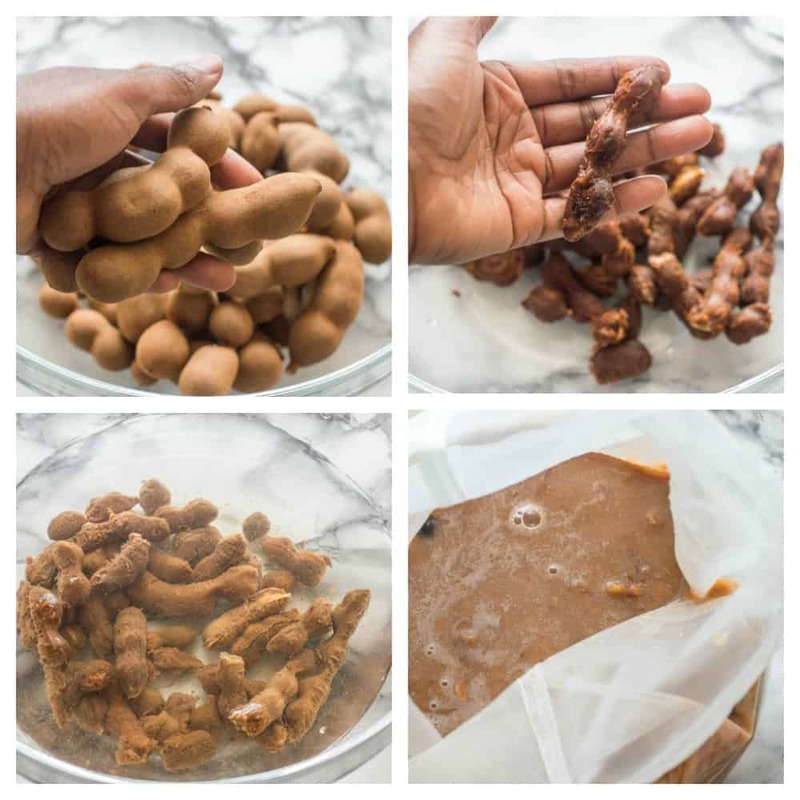 To make tamarind juice from scratch you will need fresh tamarind pods or you can use a block of tamarind paste. To Speed up the process of separating the pulp from the seeds, I pulsed the pulp with water on very low speed in a blender. This is a much quicker method then leaving the pulp to soak overnight in warm water. I also used a mesh cloth to squeeze the liquid from the pulp. If you don’t own a mesh cloth, use a strainer or muslin cloth to strain the juice instead. 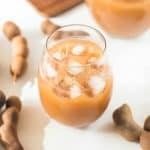 What are the health benefits of tamarind juice? Where can I buy tamarind from? You can purchase tamarind from most ethnic grocery stores including Caribbean, African, Indian and Asian. If you cannot obtain fresh tamarind pods (see picture) then use 3 blocks of tamarind paste. Use your fingers to crack the brown tamarind shells and remove the stalk from the pulp. Place the pulp in a large heatproof bowl then carefully pour the warm water over the raw fruit. Allow the tamarind to sit in the water for 5-10 minutes so it begins to soften. Pour the contents of the bowl into a tall blender like a vitamix and also add fresh ginger now if you are using it, Do this in batches if required to accommodate the volume of liquid. On the lowest setting, pulse the tamarind for 15-10 seconds so the seed separates from the pulp. The liquid will be dark cloudy brown hue and the seeds should settle at the bottom of the container. Repeat this step if necessary to ensure the seeds have pulled apart. Pour the tamarind juice into a mesh/cheese cloth or sieve and squeeze and strain the remaining juice. Work in batches if need be. Finally sweeten the juice with coconut nectar, vanilla and serve with ice. I love tamarind juice from childhood but, believe it or not, hadn’t seen the actual pods until your post. Pinning this recipe to make in my own kitchen! Your recipes always have such great tips and information. I was not familiar with Tamarind before this post but now I am intrigued. I will have try this! Perfect timing with this recipe. I just bought a block of Tamarind Paste the other day to use in Pad Thai. Now I know what to do with it. This juice looks lovely, can’t wait to try it! 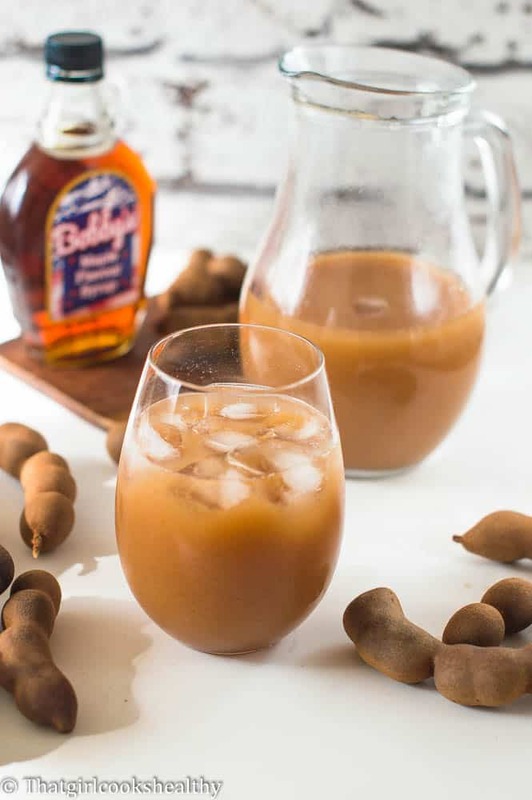 I will be the first to admit, I didn’t know much about Tamarind prior to reading this post, but now I have a better understanding on how to use it properly in food and drinks! Yes, it is so refreshing Maria. Thanks for commenting!! I really love the health benefits of this juice, and the flavors! This is the best way for my body to absorb vitamin C . Delicious!! Good day. I am from Plateau State in Nigeria. Thanks for sharing your recipe. Please can I add some sugar to the juice? Hi there, you can add sugar if you choose not to use coconut nectar. Thanks for sharing! Can I take tamarind juice on an empty stomach? What other recipes are there ? Thanks in advance. My husband and I always buy fresh and slightly frozen tamarind juice from the street vendors in St George’s, Grenada. It’s tasty drink, that cools you off while walking around the city.